What is a septic tank? That’s probably not a question you ponder much unless you are considering buying real estate that’s not on a public sewer system. It’s also possible that you’ve recently realized you have a tank that you have not had serviced. A septic tank is part of a septic system, which treats and disposes of wastewater for a single building or small group of buildings. Water flows from a structure to a watertight tank buried underground. Typically, containers are made of fiberglass, concrete or polyethylene. The tank holds the wastewater for a time while materials inside separate and decompose. Solids sink to the bottom and form a layer of sludge. Lighter solids like oil and grease float to the top, creating a layer of sludge. Septic tanks are designed so only the partially clarified water in the middle exits the tank into a drain field, which may be called a leach field, soil absorption system or disposal field. The sludge and scum stay in the tank and decompose thanks to naturally-existing bacteria in the water. Solids that do not break down will eventually need to be pumped. A septic tank’s design separates the water and solids and prevents scum and sludge from going into the drain field area, as long it is pumped from the tank periodically. Most septic tanks are single or dual compartment with a T-shaped inlet and outlet pipes. Tanks installed after 1976 are usually dual compartment tanks. 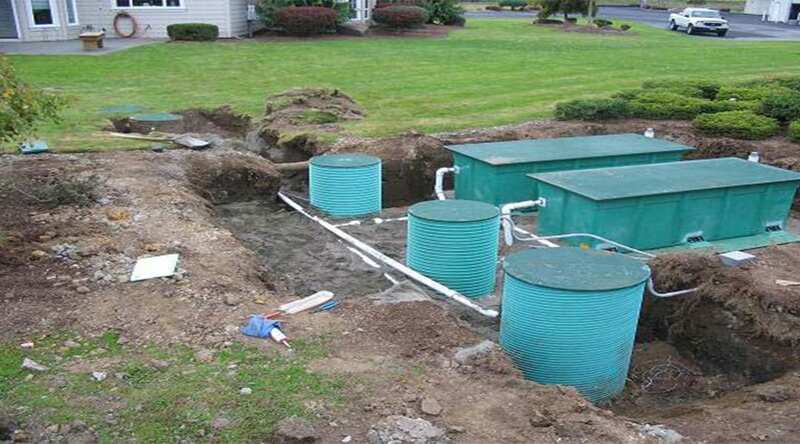 Some buildings may also have a pump tank collecting sewage after it is filtered in the septic tank. A pump tank is part of a septic system, not to be confused with a holding tank which is used in areas that cannot have a septic system, such as homes near rivers and lakes. When was the tank emptied last? Where are the septic tank and drain field? What type of tank is it and when was it installed? Has anything been built or planted over the drain field? Are there any trees within 30 feet of the tank or drain field? Will the size of the tank accommodate the needs of the family or business? Hopefully, a real estate agent or property owner can answer these questions. They may not know, however, how full the tank is now or if the tank has the healthy bacteria needed to decompose waste. Cleaners, detergents and even antibiotics can kill the healthy bacteria in a septic tank. You can get instructions on how to inspect a septic tank from your county health department or hire a professional to inspect the property’s septic system. If you have concerns or specific questions, we can help. Give us a call at 503-630-7802.